Lo! 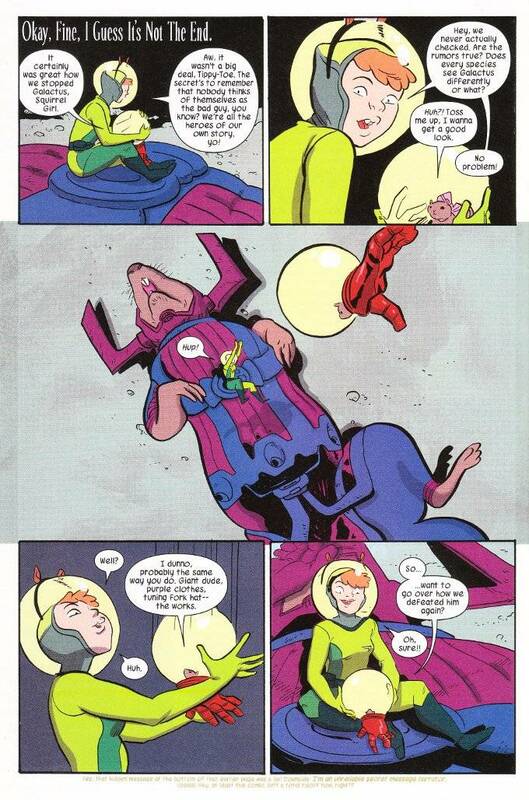 The Unbeatable Squirrel Girl has saved the Earth from Galactus in record time! In fact, she did it so quickly, that they had no choice but to publish the letters page early and show you a bunch of blank paper instead of an actual comic. Okay. They can't actually do that. So even though the ending is totally spoiled, we do get to see exactly how Squirrel Girl did it and learn a lot of interesting facts about The Marvel Universe in the process. Is it true that each species perceives Galactus in a different fashion? Does The Power Cosmic allow you to understand squirrels? 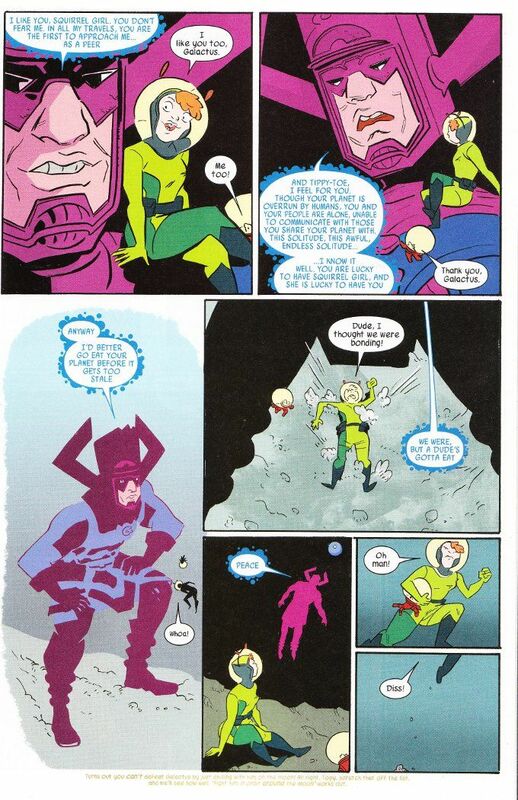 And why does Galactus dress like a giant tuning fork? Okay. That question doesn't get answered. But shouldn't it? There is little I can say about this book beyond the fact that it is a laugh riot. There's no complicated story nor heavy continuity to discuss. This book is just a fun read. And that is all it needs to be. For goodness sake, you have Galactus and his purple helmet talking to squirrels in space! If that description doesn't make you smile, you probably won't enjoy this book. Also, you have no soul. I must confess the artwork by Erica Henderson - while largely excellent- seems a little wobbly at times this month. That said, I believe this was by design, meant to portray the strangeness of space. Either that or she's unable to hold her pencil straight because she is laughing so hard from reading Ryan North's scripts. I know I couldn't, were I inclined to hold a pencil while I read this book. Perhaps I'll make that a challenge for next month's issue?